⭐️⭐️⭐️⭐️⭐️ What a delightful surprise this book was!! A lovely, charming and beautifully written account of Jane Austen’s first love interest, Edward Taylor, inspired by true events. Jane Austen is 15 years old when the book opens and excited when she learns that she is to accompany her mother, sister, and younger brother to visit her elder brother Edward, who resides with Thomas and Catherine Knight of Godmersham Park, Kent. Edward is recently engaged to Ms. Elizabeth Bridges of Goodnestone Park, and the family is invited there to celebrate a month-long multitude of festivities, to Jane’s overwhelming delight. As they got underway to Goodnestone their carriage met with peril and was nearly upset, leaving them virtually stranded on the road. When circumstances begin to look grim, Edward Taylor appears and rescues them. This is where Jane and Edward make their acquaintance, and she is at once smitten by his smart appearance. Jane eventually learns that Edward is highly accomplished; at 17 he’s traveled the world and been educated by many Masters, speaks several languages, been in the company of numerous influential people including princes, ambassadors and lords. She’s enamored by his opinions and thought processes regarding various subjects, and appreciates how his insights encourage her to think differently about some of her own deeply entrenched ideas. He is also somewhat of an enigmatic fellow and likes to take risks, challenges commonly accepted practices, and prefers not to inherit and manage his father’s estate. The daredevil in him is somewhat displeasing to Jane on more than one occasion. Nevertheless, Jane feels certain that she truly loves Edward. Or does she? I was enraptured and caught away by the mention of balls, picnics, garden parties, long walks and similar activities that the family engaged in. The visual detail of the aforementioned was splendid and I felt transported back in time where I could be a spectator of Jane’s young life. Character development was excellent and I could easily envision many of the key family members, friends and acquaintances that were met with while I read along. It was nice to see the close bond that was evident between Jane and her older sister Cassandra, and also her younger brother Charles. I also liked how the book reminded me of Jane Austen’s book Emma, and her disastrous match-making attempts. Mostly I loved watching how Jane and Edward’s attachment unfolded. This was the first book I’ve read by Syrie James and I was truly impressed!! So much so that I immediately looked into her other books and purchased one in audiobook format. 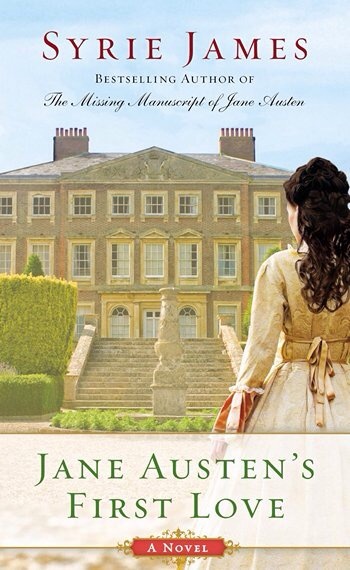 If you enjoy Jane Austen inspired works, I trust you will be thrilled when you read Jane Austen’s First Love. MAGNIFICENT, and highly recommended! Thank you Laurel Ann Nattress of Austenprose, and Syrie James, for providing me with a copy of this book in exchange for an honest review, which I have given. It was indeed a wonderful story. Thanks for stopping by. This book looks great and I would love to win. Thank you, Dina. I’m sad too that the tour is ending–it has been great fun. But in case there’s a stop you missed, there is still almost a week left to drop by and leave a comment before I pick the prize winners! It was so fun being part of this tour and to be able to read the book, I have read all of Syrie’s other books and appreciated her care and writing with these precious women I cannot seem to get enough of. Visiting the tour stops today has been so interesting. I love reading about other’s thoughts on JANE AUSTEN’S FIRST LOVE and touring around their blogs. I think your banner is beautiful and have enjoyed visiting and look forward to doing so again and again. I am hoping this holiday with Jane blog tour becomes a tradition. I think Austenprose and Syrie James are just the two to make this happen. What a great idea, poofbooks! So glad you enjoyed the tour. Thanks so much for participating and for hosting me along the way! I enjoyed your review! This novel is on my “To Be Read” list — it sounds wonderful! Thank you Trish. It was really a great book! Hi Trish. I’d be thrilled if you treated yourself to a copy of Jane Austen’s First Love, or put it on your gift wish list–and I hope you love it! Have a great holiday! These house parties sound so enchanting!A handsome knight in shining armour! No wonder he caught Jane’s eye!Thank you for the giveaway and Merry Christmas! Thank you so much for your detailed review. It makes me want to read this book even more! I am so grateful for your wonderful review, Cozynookbks. Thank you! I’m thrilled that you loved the book, and hope everyone else does, too. Many thanks for being part of my holiday blog tour. Thanks to all for your comments. Wishing you the happiest of holidays! I loved your book!! Thank you for allowing me to be a part of your wonderful blog tour. Wow. Great character development and you felt transported back in time. You can’t ask for more from a book. I truly felt that way. It was such a good book. This is such a fascinating book the more I read the reviews about it, it has me more and more interested and excited to read it. If you read it I am sure you will enjoy it!! This book has been a joy to read. You are going to love her other books as well. Wouldn’t a movie of this book be fantastic??!! I’m with you on that. Thx for the comment. Thanks for your comment Beth. I thought the book was truly excellent. Sorry. I thought the first comment was lost in limbo. It intrigued me as well Deborah. A great book that you will surely enjoy. Thanks for the comment. I can confidently say that you will enjoy it!! Hi Deborah Anne, and thanks for your comment. Everything I learned about Edward Taylor just fascinated me. He came from a large family, and he and his brothers used to do all kinds of athletic and risky things. It was fun to imagine him and bring him to life in Jane Austen’s First Love. I hope you love the novel!